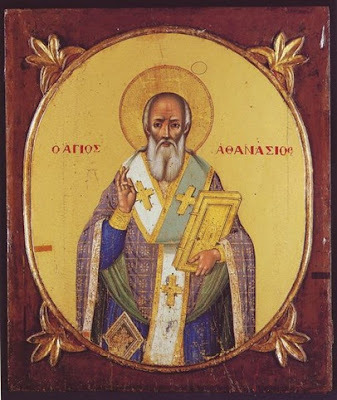 On the second of this month [May], we commemorate the translation of the relic of our Holy Father Athanasius the Great, Archbishop of Alexandria. That even dead are you sent away in exile? On the second Athanasius was stripped of his corpse in the sepulcher. Our Holy Father Athanasius lived an angelic life on this earth. The struggles this man who is worthy of blessings faced on behalf of the Orthodox faith, and the battles and resistance he made against the heretics, with the continuous and unjust exiles he endured, and the slanders and vain criticisms he received from the cacodox, all these things, I say, have been narrated in other histories, though the most lengthy is by Gregory the Theologian. Therefore I, not wanting to narrate all things here referred to by historians, will briefly say a few things to consider. Athanasius the Great, named after immortality, had as his homeland Egypt. His parents were wealthy and virtuous, and he was brought up near them. When he was a young child, he went with other children who were playing at the seaside, and they played the following game. Of those children, some played Priests, others Deacons, and Saint Athanasius was ordained Archbishop. Then they brought before him some children who were unbaptized, and Athanasius baptized them in the waters of the sea. By chance Archbishop Alexander of Alexandria saw this, and he marveled at this very much, foreknowing through the Holy Spirit that this ordination of Athanasius foretold the ordination he would later receive. For this reason these children he did not baptize a second time, but only anointed them with Holy Myrrh and thus completed them. 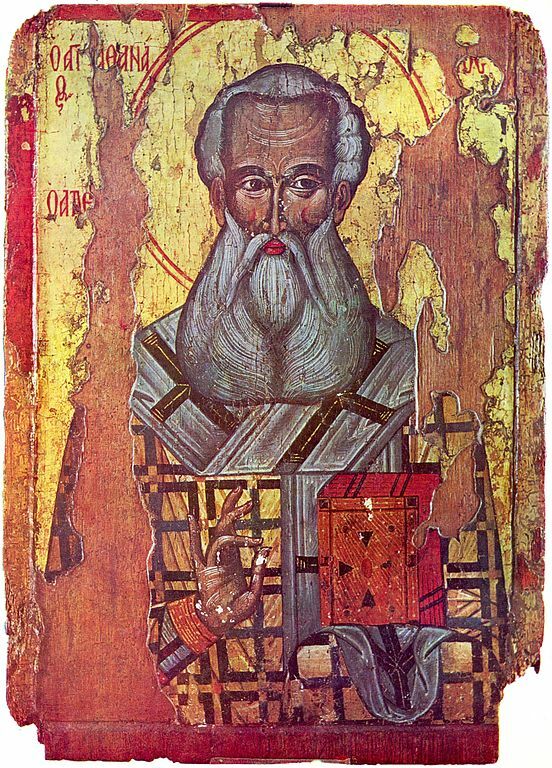 Athanasius was given to a child educator to be taught sacred letters. When the Saint reached a mature age, Alexander ordained him a Deacon. And when the Holy First Ecumenical Synod gathered in Nicaea in the year 325 during the reign of Constantine the Great, Alexander brought him along to Constantinople as a colleague and helpmate, and together they renounced those who were minded towards the impious and blasphemous presumption of Arius. 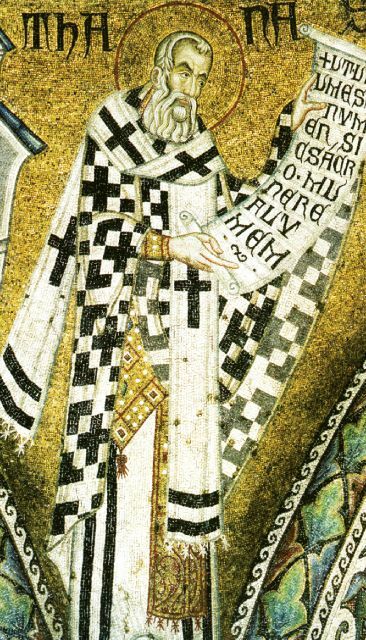 Not long after this Alexander died, and Athanasius the Great became Archbishop of Alexandria, a year after the First Synod, in the year 326. The companions of Eusebius the Arian could not gently endure the elevation of the divine Athanasius. Thus by their treacherous words they persuaded Constantine the Great to banish Athanasius from his throne. After Constantine the Great exiled him to France, he died. * Therefore Athanasius made his way to Rome, where he spoke with Constantine, the eldest son of Constantine the Great, and receiving letters from him, he went to the eparchy of Alexandria. When Eusebius and those like-minded with him found out about this, they would not cease making a fuss. Therefore they made up and stitched together every form of slander, persuading Constantius, the second son of Constantine the Great, to gather together a Synod in Tyro, in which Athanasius was to be judged. Many were the accusations the Arians brought against him, of which I will only mention one here. Arians took the hand of a dead man, and drying it up they placed it in a case. They then presented it to the Synod saying that this hand belonged to someone named Arsenios, who, they said, was killed by Athanasius by means of magic. By divine Providence Arsenios came to Tyro in those days, and the Arians hid him, for they were afraid the slander against Athanasius would be revealed. When Athanasius the Great found out that the infamously dead Arsenios of the Arians was there, he met him. And when the day came for Athanasius to stand trial at the Synod, he brought Arsenios with him, dressed in other clothes. Athanasius therefore was judged and accused of murdering Arsenios, and he asked those present at the Synod if any of them knew who Arsenios was. When many said they knew him, then he uncovered him before the Synod, and asked if this was Arsenios, to which they replied that yes indeed he was. Then they showed him his right and left hand, saying: "Behold the right hand, behold the left hand - of which we people born of Adam received two hands from God the Creator. Wherefore let no one ask for a third hand of Arsenios." This shamed the Arians very much, and they left the Synod, urging the people to move against Athanasius. For this reason blessed Athanasius secretly left the city of Tyro, and descended into a dry well that was dark and waterless, and there he hid for six entire years. Coming out of the dry well, he went West, which was under the authority of Constans, the third son of Constantine the Great. Approaching the emperor and the then Pope Julius I, he told them of his misfortunes. Together they issued the Saint letters, and sent him to Alexandria. When the eastern emperor Constantius learned of this, who was deceived to think like the Arians, he ordered a ruler, Syrianus by name, to go to Alexandria and put the Saint to death, in order to elevate to the throne of Alexandria one named Gregory. 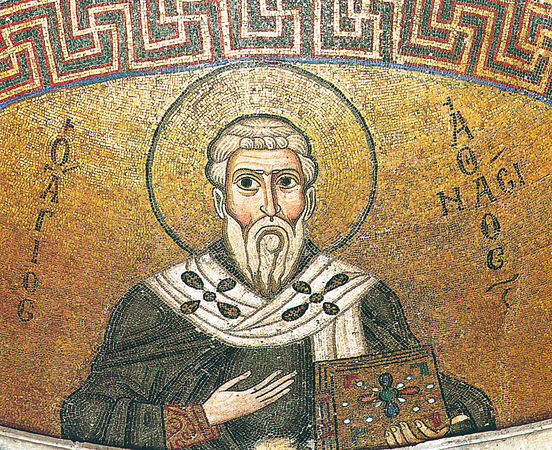 Athanasius was rescued from the hands of Syrianus, and returned to Constans at Rome. Constans wrote a most fierce letter to his brother Constantius, in order to have Athanasius restored to his throne. And if this was not done, then he should know that he will have him restored to the throne with royal arms. Constantius received this letter and was afraid, therefore he restored against his will Athanasius in Alexandria. Because Constans died shortly after this, and Constantius was proclaimed emperor, for this reason he sent men to capture Athanasius. Having found out about this beforehand, the Saint secretly left the patriarchate, and fled to a woman adorned with virginity and other virtues. When she learned the cause of his flight, she received him with joy and served him, and took care of the Saint in every way over a period of six entire years. ** When Constantius died, Julian the Apostate became emperor, therefore the Saint immediately left the house of the virgin at around midnight, and presented himself before the Church. How much joy was had by all the Alexandrians when they saw the Saint, and how they ran to him and thanked God, cannot be told at the present time. Julian became emperor in 361, and all things took second place to him, until he achieved the removal of the Saint from his throne, and he would do this by removing him from this life. Therefore men were sent to have him killed. The Saint fled, remaining uncaught because he left by night, and he went to the Nile River, where he found a boat, and entering therein he went to the Thebaid. Because his hunters caught up to him, he deceived them and turned around, returning to Alexandria, and there he hid as long as Julian was alive. Since that wicked man was wickedly slain, he died and Jovian became emperor in 363, but he also having died shortly thereafter (he ruled only seven months and twenty-two days), Valentinian became emperor, who made his brother Valens co-emperor in the year 364. Valentinian ruled the West, while Valens ruled the East. * In order to avoid scandal regarding the exile of Athanasius by Constantine, we will offer the apology of Theodoret of Cyrus on this matter (Ecclesiastical History, Bk. 1, Ch. 31): "It ought not to excite astonishment that Constantine was so far deceived as to send so many great men into exile: for he believed the assertions of bishops of high fame and reputation, who skillfully concealed their malice. Those who are acquainted with the Sacred Scriptures know that the holy David, although he was a prophet, was deceived; and that too not by a priest, but by one who was a menial, a slave, and a rascal. I mean Ziba, who deluded the king by lies against Mephibosheth, and thus obtained his land. It is not to condemn the prophet that I thus speak; but that I may defend the emperor, by showing the weakness of human nature, and to teach that credit should not be given only to those who advance accusations, even though they may appear worthy of credit; but that the other party ought also to be heard, and that one ear should be left open to the accused." ** This woman is Saint Syncletike, whose life was written by Saint Athanasius. *** Saint Athanasius died on May 2, 373. There is no tradition of the translation of his relics. 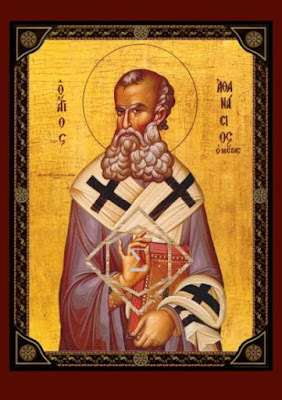 Rather, this feast on May 2nd is considered his primary feast day, while that of January 18th with Saint Cyril of Alexandria is merely meant to be a supplement to the feast of the Three Hierarchs celebrated on January 30th. This is further testified by the fact that in none of the hymns of May 2nd in the services are there any references to the relics of the Saint, but instead reference his life like any other primary feast of a saint. O Hierarch Athanasius, thou wast a pillar of Orthodoxy, supporting the Church with divine doctrines; for thou didst proclaim the Son to be of one essence with the Father, and didst put Arius to shame. O Venerable Father, entreat Christ our God to grant us His great mercy. Thou didst plant the dogmas of Orthodoxy, and cut out the thorns of false doctrine; thou didst water the seeds of faith with the rain of the Spirit, O Venerable Father. Therefore we call thee blessed.